Thirty years ago when we were first seeing 30 hp variable frequency drive (VFD) the size of a refrigerator (and now the size of a brief case), and there was no such thing as a severe duty motor, and it was an absolute TABOO to use a variable frequency drive (VFD) for variable speed. Actually for variable-torque applications, severe duty motors are not required... You are just wasting money for the severe duty motor! When using single stage pumps, the pump speed is critical, and the pump curve should be verified. But when using submersible pumps, these are typically multi-stage (maybe 15+ stages) and can be reduced much lower in speed. With centrifugal pumps, of course efficiency drops off. Fans have a much lower threshold as where they become ineffective. We have done many pump and fan variable drive applications in the last 30 years, and turning the speed down has never been a problem... With constant-torque applications, it is not recommended to go below 30% even when using a severe duty motor. I have used surge testing since 1989 in motor manufacturing, motor repair shops and for field testing of motors. I am a big fan of surge testing and have performed over voltage surge tests on 10,000s of motors. It is the only test which can detect weakened insulation between phases or coils in a connected winding. It is a standard test performed by every reputable motor manufacturer and motor repair shop in the world. And it is an excellent test for verifying insulation in the field. Surge testing, like hipot testing, can be performed at voltages greater than motor nameplate voltage. It is common to perform hipot and surge testing at voltages well above nameplate voltage to verify that an insulation system can withstand the voltage transients and other mechanical stresses which occur at start up. The recommended field hipot and surge test voltages are 40% or more lower than voltages used by manufacturers and rewinders. Most variable frequency drives (VFD) employ the PWM control method. Variable frequency drives generate the AC by switching the main circuit elements. 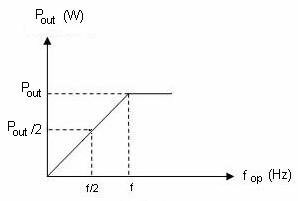 This principle of operation can be referred to as the noise source. Noises generated from a variable frequency drive are broadly classified into the following types: those radiated from the cables connected to the VFD and VFD main circuits (I/O), those electromagnetically and electrostatically induced from the signal cables of the peripheral devices close to the main circuit power supply, and those transmitted through the power supply cables. The VFD vector control considers the instantaneous electrical quantities referred to the rotor linkage flux as vectors and its equations are based on the spatial dynamic model of the motor. 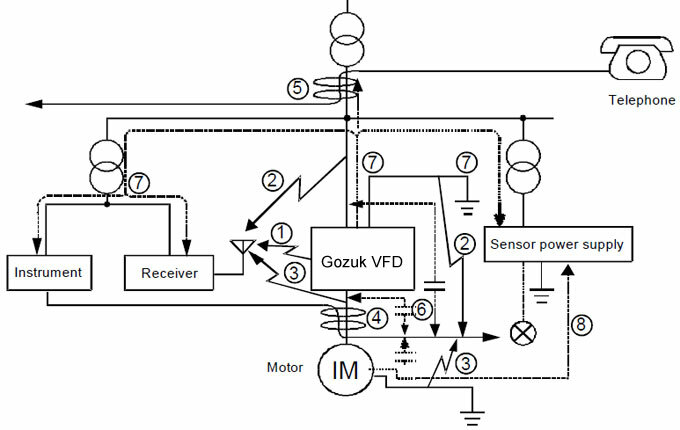 The VFD that I selected and ordered for the control of a standard 1,1kW induction motor in the electric laboratory is from the manufacturer Gozuk. Out of a whole list of VFDs this one seemed the best for future experiments in a practical course about control of electric motors and the simulation of an electric vehicle. The vector control VFD, Gozuk made, is a standard but modern VFD with a lot of opportunities to explore, like open loop and closed loop vector control. 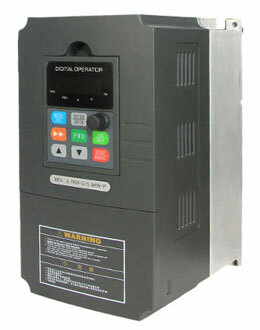 The variable frequency drive is developed to control induction motors in an automated environment. This includes that many of the possibilities of the vector variable frequency drive cannot be discovered without additional automation tools to deliver feedback to the vector variable frequency drive. In this paper the connection is made with the theory about VFD. This guideline discusses variable frequency drive (VFD) basic working principle and how installing variable frequency drives in appropriate applications could save energy, cut costs and increase profit margins. Whilst there are a number of variations in variable frequency drive design; they all offer the same basic functionality which is to convert the incoming electrical supply of fixed frequency and voltage into a variable frequency and variable voltage that is output to the motor with a corresponding change in the motor speed and torque. The motor speed can be varied from zero rpm through to typically 100-120% of its full rated speed whilst up to 150% rated torque can be achieved at reduced speed. The motor may be operated in either direction. Variable frequency drives applied to AC motors are by far the most common. Variable frequency drives are typically 92-98% efficient with 2-8% losses being due to additional heat dissipation caused by the high-frequency electrical switching and the additional power required by the electronic components.